Total-loss insurance payouts may leave your customer with a financial gap in coverage - owing a loan balance even after the insurance settlement. 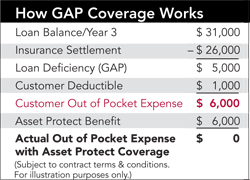 Asset Protect closes that financial gap and provides your customer the peace-of-mind protection they deserve. Maximize Your F&I Potential & Contact Us Today! Take full advantage of this profit-growing opportunity.